Baruch Guest House Stellenbosch offers the best of both, a perfect balance between homely accommodation, comfort and quality service. Inspired by the tapestry of life we dedicate our service to making each stay memorable giving you a sense of peace knowing that we practice what we preach. 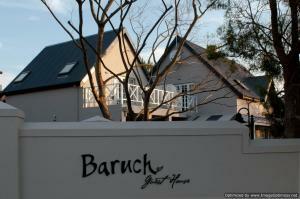 Baruch is a four star rated guest house which offers the corporate visitor the perfect base as it is close to Techno Park, Stellenbosch Town Centre and University. It is a 5 minute walk from the Stellenbosch Medi Clinic, Die Boord Shopping Centre and Markotter Sports Grounds and two minutes drive from Stellenbosch Golf Course. Baruch is also in close proximity to all local schools and is only a short distance away from all Stellenbosch wine farms. Baruch Guest House currently accommodates corporate clients from MediClinic, Distell, Capitec and University of Stellenbosch.